I crossed the Vietnam- China border at 05.30 pm, therefore when the first curious guy approach me I asked him for a cheap hotel. And I was surprised, because he took me to a simple pension, and he paid it for me. The next day I started to cycle to the north, along the Yellow Sea and I had great expectations, I was happy and curious, because although it had passed 20 years from the new policy of reform and opening, allowing the entry to tourists, China still remains under the aura of mystery. That afternoon I stopped at a tavern to rest and eat something, I remember there was only one group of people present and waiting to be served. Immediately they offered me some fruits and they invited me to have lunch together. And although we could not understand each other, I accepted. We were served with soup, vegetables, beef, pork, fish, chicken and rice. From my side I ordered a fish dish, although according to Chinese custom, food is not served in individual plates, but it takes place in the center of the table from where everybody serve themselves using a saucer. That afternoon when I left the place they didn’t let me to pay my bill and they even gave me a couple of sodas and fruits to carry with me. The official language of China is Mandarin, but there are five completely different regional versions, associative to a strong sense of culture and tradition. The paradox is that Chinese people from different regions can not be understood through speech, but they can even make it through writing. My trip through the South took me through Qinzhou, Zhanjiang, Zhuhai and Beidou. I have cycled nearly 1000 km during more than two weeks, through the national road and secondary roads, I crossed rivers on rafts, I got soaked in the rain and as many other times I got lost. But the prize was to arrive to Hong Kong. Hong Kong is an autonomous region within China, which has arisen due to the fluid trade between East and West since the 16th century, under the dominion of the British who occupied the territory until 1997. Today Hong Kong is a cosmopolitan and frantic city which vibrates day and night. According to Hipolito explained me, at the beginning of 19th century when China tried to end the lucrative opium trade promoted by the British, they responded with the blocking of Chinese ports in 1841 ensuring the island of Hong Kong as its own commercial area. Thus, the area previously inhabited by farmers and fishermen developed quickly and after World War II the trade was re-established and industry soared. In the last years of British rule Hong Kong became one of the major financial centers of the world. When I arrived to Hong Kong I met Hipolito, an Argentinean from Beluchi, Catamarca who manages the Argentinean restaurant: “La Pampa.” So we had dinner together and we became friends quickly. 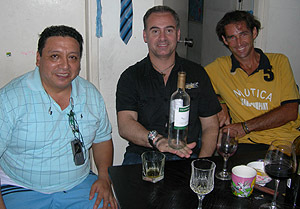 Then he invited me to his house to spend the rest of my stay there, where everyday I ate Argentinean food. Hipolito received me as a brother and my stay in Hong Kong was wonderful. I visited Central area, Wan Chai and Cause Bay and also Stanley Bay, Kowloon and Lantau Island, but despite all the nice places and people I met, the most beautiful was to watch the first part of the world cup with the Argentinean residents, and I felt like at home. I also visited Macau, where first Susana and then Iuri took care of me. 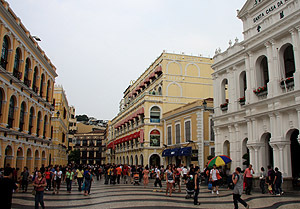 Macau is also an autonomous state within China, but with Portuguese origin, an old city which blends colonial architecture with luxury hotels and dozens of casinos. A place worth visiting. 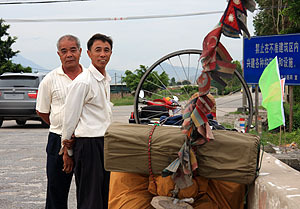 My road to Shanghai was through the Chinese province of Guangdong and as in the south I had not any trouble. 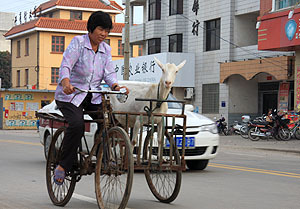 But then the route took me through Fujian and Zhejiang provinces, where the reception of the people wasn’t the same. Several times to find a place to sleep became an ordeal. 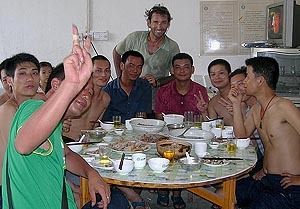 Then I knew that in China, there is a law for which foreigners can not stay in cheap accommodations, forcing them to host at medium class hotels. In the South, Chinese people don’t care about this law, but in the center of the country nobody cares about tourist, even if they are the only option in the town. Some nights I spent over an hour to find who turn a blind eye to the law. And one night while I was taking bath in the only one hotel of the town, police came to knock the door of the bathroom and ordered me to leave the hotel. It had been the owner of the hotel who had called them. But we could not understand each other, so I called a friend who explained them about me. I also showed them some newspaper articles about my trip, but they did not care. So I had to leave the place and the city. “Curse! !” I thought. I had ridden 110 km and I was so tired, it was already 9pm. So I had to cycle to the next town, 30 km. But I was lucky, because when I was arriving I found a good place to camp, something that is not very common in eastern China. It was 11pm and I just thought to have dinner and to go to sleep. I was destroyed. I also remember another day when I was cycling I noted alongside the road a group of farmers working, so I stopped to do some video footage. But then a man came and ordered me to leave, screaming and throwing a blow to the camera, which fortunately I was able to dodge. Then other people surround us, some of them to intimidate me and other to pry. And although I got scared a bit I didn’t show, but slowly I began to keep my things while reproaching the man. The man was aggressive, and therefore I did not hesitate, I kept my things and I started to cycle. 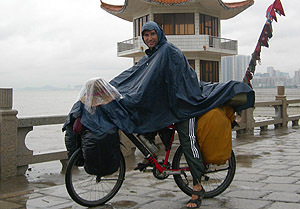 To cycle 1300 km to Ningbo took me three weeks, I crossed Shenzhen city, Shantou, Xiamen, Quanzhou, Fuzhou and Wenzhou. None is smaller than 6 or 7 million people and all of them have an endless port area. 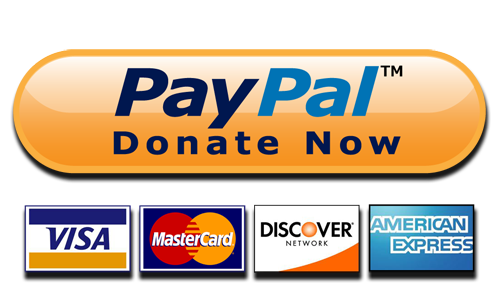 Between the cities there are only industrial areas, smaller populations or flooded fields for rice plantations, and therefore no place to camp. Except few places, on the south coast of China is unusual to find tourist destination or tourists. According people explained me, due to there are not opportunities for working in rural areas, tens of millions of people have moved to the east, looking for better living conditions, causing a population explosion and the consequent demand for energy. Today China is the second largest polluter in the world after U.S., and in many places there is a stifling atmosphere. And eastern China is proof of that. On the road to Shanghai I met Renan, a French guy who hosted me in Fuzhou and who is living there since more than a year; and also Helen and Christine, a Russian and a Polish girls who live in Xiamen. The funny thing was that everyone agreed about living in China is very easy. “To be foreigner make us different and thus we have certain advantages”, Renan told me. They said to me, that due to the influence they impose on young people, in their free time, they work as models for clothing brands or frequent bars which pay them only for going a couple of hours, and where they have the free drinks too. Days later in Shanghai, I witnessed it, because Rodolfo took me to a bar where we had the first three free drinks, the reason he told me: “because we are foreigners”. 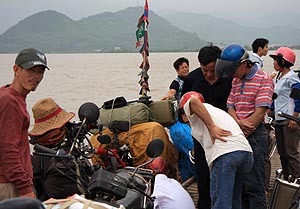 My last stop was in Putuoshan island, where I arrived by boat from Ningbo. There the Mutuo mountain exist, one of the four sacred mountains in Chinese Buddhism, which is the main religion in the country, although according a friend explained me, most of the followers practice Buddhism more like a philosophy than a religion. During my journey in China I also learned about Budai, the smiling Buddha or the fat Buddha. Budai was a Buddhist monk who lived 1000 years ago, a caring man, pious and good-natured, so he came to be seen “symbolically” as Maitreya, the future Buddha. So Budai, with his large belly and bright smile turn into a deity who brings about happiness and abundance. That is why today, his image decorates many temples, restaurants, and amulets around the world. 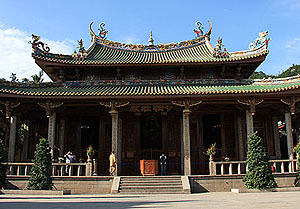 The Taoism is another predominant religion in China, which rises in the 4th century BC as a philosophical system, and it became a religious movement later. According to Li explained to me, the basics of Taoism are based on the existence of three forces: a passive, one active and one third, conciliatory. The first two both oppose and complement each other, this means, they are absolutely interdependent and they function as a unit. The Yin (white) is the passive force, subtle, the female principle, the earth, the darkness. The Yang (black) is the active force, concrete, the male principle, the sky, the light. The third force is the Tao or superior force which contains them; and according to traditional Chinese philosophy is the cause of all things. The symbol of Tao is the Taijitu. Li told me: “the purpose of the Tao is to teach the man to become one with nature, teaching him to flow, to integrate himself in agreement and harmony”. 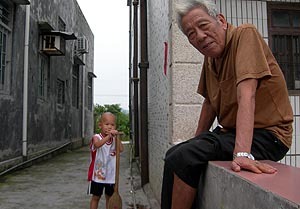 The other two dominant religions in China are Confucianism and traditional Chinese religion, in many cases, are conducted jointly and in a form of religious harmony. Anyway, for almost 2 months which I was in the country, very few Chinese people seemed “religious” when compared them with people from other Asian countries which I have already visited. But rather they seemed “capitalists” who are not really interested in learning or practice of religion. And finally I arrived to Shanghai, the largest and most dynamic city of the country with a population of more than 15 million inhabitants. 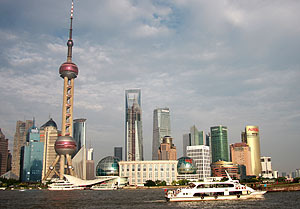 Although it was only after 1990 when the Pudong area was declared a special economic area that the city shone. According people explained to me, since the investment came up frenetic and highways, bridges, tunnels, shopping malls and luxury hotels were built. Thus, due to its recent explosion and economic and industrial development Shanghai became one of the fastest growing cities in the world.